nCleaner is a free Windows tool for cleaning both your system and applications, claim back disk space, boost your computer speed and achieve better stability and privacy protection. This software is safe to use, has a great reputation and has always been one of my secret weapons. 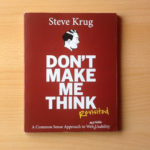 In combination with free programs like Avast, I do a pretty good job of keeping my computer in good working order by stopping it from getting gummed up with unnecessary files. Me and nCleaner have been together seven years. (LOL). 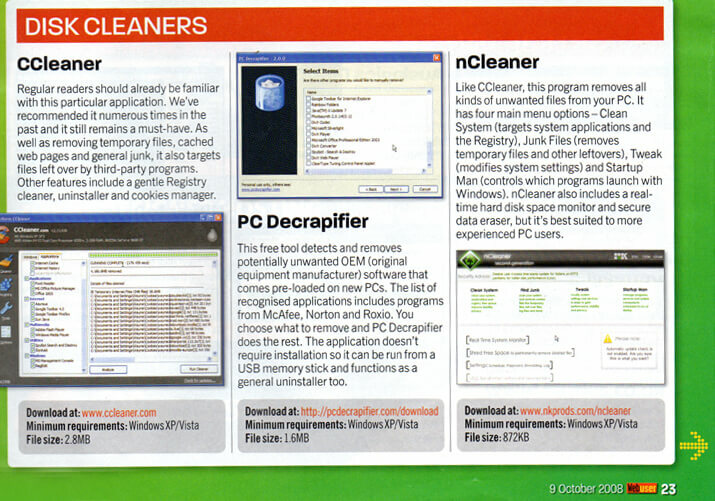 A review of the software back in a 2008 issue of Web User magazine caught my eye. Immediately I downloaded it (along with cCleaner) and have never looked back. Amazingly, I still have the magazine in which I originally saw the review. Below is a page scan from Issue 198, October 2008. I almost always click the button on the bottom left and do a straightforward clean. If you don’t know what you’re doing, you’re best advised to leave “Registry clean and repair” option alone. Deleting registry files can seriously screw up your operating system. Proceed with caution. 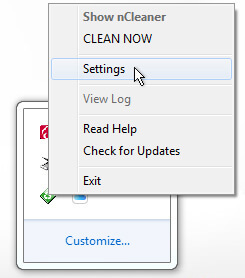 Click “Clean Now” then “Aanalyze”. Once you “Analyze” your system, you have the option to “Clean” the files. A few registry entries are included as you can see below but these particular entries are harmless and safe to delete. If you want to find out how the software has been performing, and how much free space has been recovered on your hard drive, you can do this easily. Just click “info” on the top right of the nCleaner window. 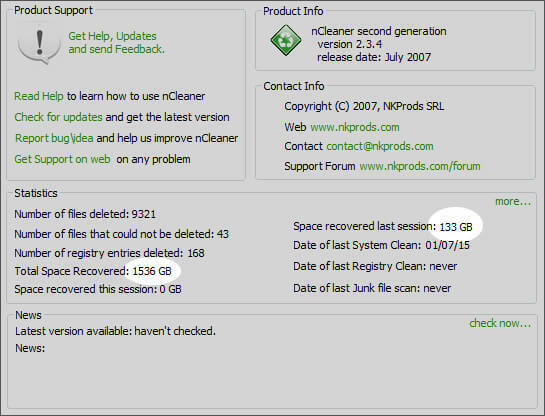 To change the preferences, simply locate the green nCleaner icon in the system tray down on the bottom right of the Windows desktop. Right click the icon and choose “Settings”. This will give various options on how the software works. For example, you can choose whether or not to boot the software every you start up Windows, amongst other things. Did you know that deleting data from your computer doesn’t really delete it? Even if you empty your recycle bin, in the hands of a professional, it is possible to recover previously deleted files in their entirety, meaning sensitive information about you or your business could become known by another individual. 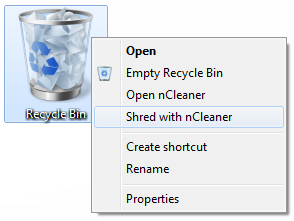 One of the features of nCleaner is the ability to shred data permanently, which you can do by right clicking the Recycle Bin and choosing Shred with nCleaner. Makes your system faster, more stable and protecting your privacy. Cleans over 90 system and applications items (locations) and over 180 application plugins. Clean your registry and fix Windows errors. Monitor your system resources to maintain a certain amount of free disk space and optimize memory usage. Monitor you system using the System Advisor and correct critical Windows errors. Protect your privacy by shredding all deleted clean items (using professional algorithms), so they cannot be recovered using specialized recovery software. 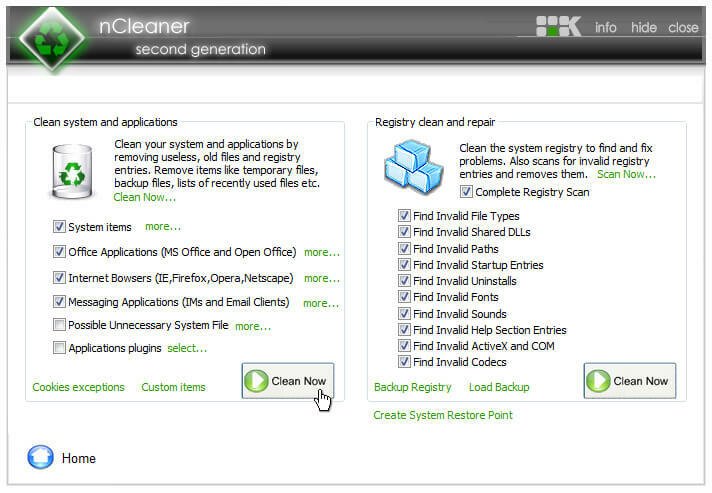 Add custom files and folders to be cleaned on each system clean. Choose which cookies you want to keep and which you want removed. Shred free space on all hard disks and partitions, so that previous deleted files cannot be recovered using specialized recovery software. Tweak your system to make it faster and stable by disabling unnecessary features and services and recover resources. Use predefined Tweak profiles to enable the best Tweak configurations. Use the advanced Startup Manager to see ALL objects launched at startup including services and system objects. This powerful module allows you to spot hidden viruses or unwanted applications and disable them. Use the advanced Startup Manager to save a list file with all objects that are launched at startup. Find unnecessary files on your system (backup files, log files) and remove them. You can also add your own files you want to scan for and remove. Schedule cleans at startup, shutdown, on browser close or time based. Maintain log file with all actions and the time when they occurred. Choose one of 4 shredding algorithms for best privacy protection or clean speed. Password protect key, sensitive features in the application while still allowing cleaning the system.